S I G N & D I G I T A L G R A P H I C S • August 2018 • 59 Carlsbad, California, which sells signage and bracketry products primarily to sign shops for installation in a retail space. The signs are ideal for businesses or organizations that may lack major thor- oughfare access and still want to be seen. Or there may be zoning laws or local signage codes limiting the size of a sign, especially in neighborhood areas. "The most likely application is in- town with lower-speed driving versus thoroughfares with high-speed traffic," Schulz says. "The appeal of the post and panel is that it prominently identifies the business, neighborhood or organi- zation for people entering the property or approaching the building—(giving it that) charm and curb appeal." 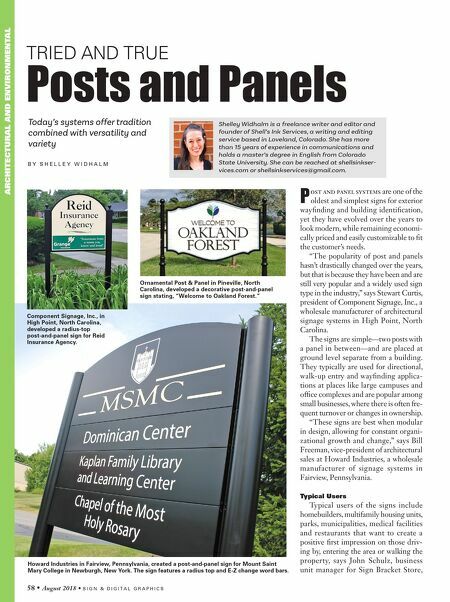 Post and panel signs get the business's presence closer to the road and in front of that traffic, Curtis says. Separating the sign from the building also makes it eas- ier to see the sign, especially if the build- ing is far from the roadway or obstructed by objects, he says. "Many buildings are situated parallel to the road access, which will only allow a visual line to its sign once the viewer is immediately passing by the building," Curtis says. "A post and panel sign allows the sign to be located closer to the street and can be perpendicular so that the viewer can see the sign long before they get to the building. This drastically helps the exposure of the business." A tighter, more compact space makes post and panel signs ideal, since visibil- ity is reduced, bringing the line of sight closer to the ground, says Frank Iyoob, operations manager of Ornamental Post & Panel, a wholesale custom sign manu- facturer in Pineville, North Carolina. 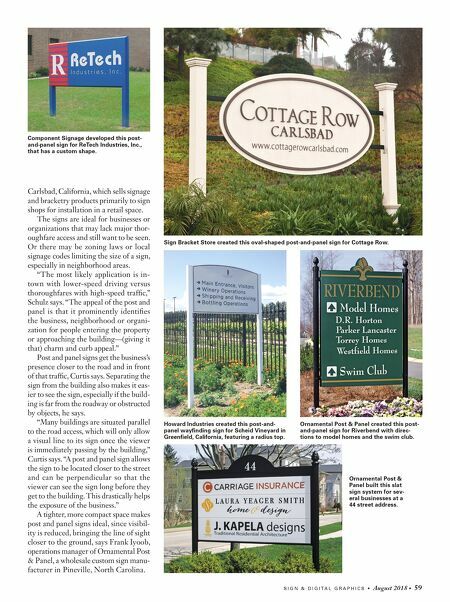 Sign Bracket Store created this oval-shaped post-and-panel sign for Cottage Row. Ornamental Post & Panel created this post- and-panel sign for Riverbend with direc- tions to model homes and the swim club. Component Signage developed this post- and-panel sign for ReTech Industries, Inc., that has a custom shape. Howard Industries created this post-and- panel wayfinding sign for Scheid Vineyard in Greenfield, California, featuring a radius top. Ornamental Post & Panel built this slat sign system for sev- eral businesses at a 44 street address.